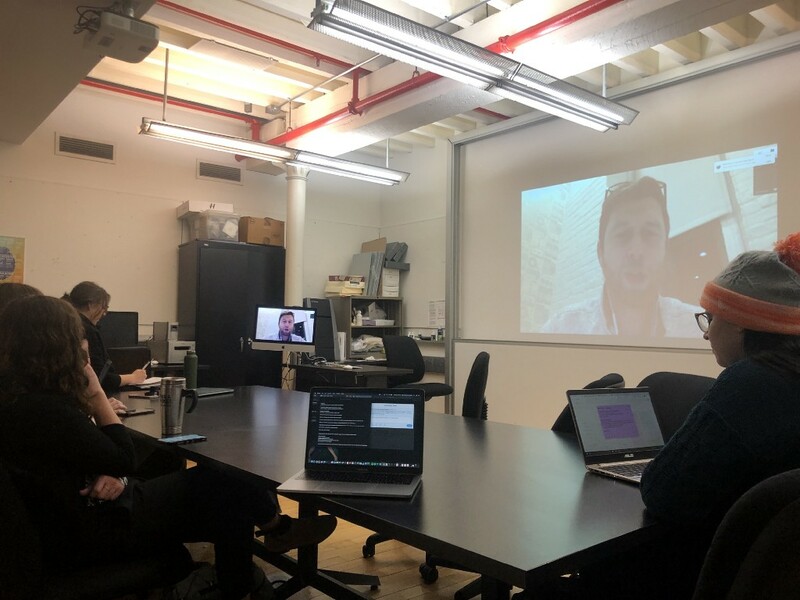 Last Wednesday Pratt Emerging Museum Professionals (also known as PEMP, a student affiliate group of the National Emerging Museum Professional Network) hosted a talk with Dan Sullivan, Head of Growth Partnership for Cuseum. 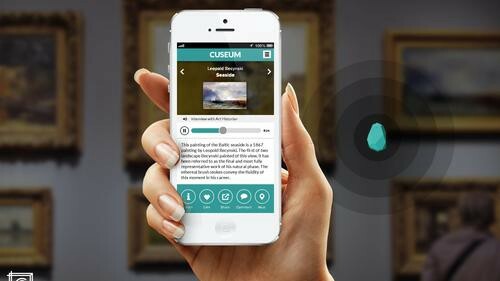 Cuseum is a company that partners with museums and cultural institutions in digital projects. They are dedicated to helping museums transform the way people interact with art and culture. During his talk, Dan emphasized the complementary relationship between technology and art. Although this claim may seem self-evident to me, a student in a Museums and Digital Culture graduate program, the inclusion of digital technology in museum environments is essential for a variety of reasons. In a world where technology is quickly outpacing and replacing real-life experiences, museums have traditionally felt threatened by the apps and websites that draw potential museum constituents away from visiting their sites. Despite the allure of Netflix and Fortnight, digital projects in and of themselves are not inherently threatening to museums. During his talk, Dan offered insight into the ways companies like Cuseum can help museums take advantage of technology as a means to enhance their physical collections and engage visitors. In my Museums and Digital Strategies course, we have focused on a wide range of technological projects stemming from website redesign to in gallery experiences. During the Cuseum Talk, Dan Sullivan focused on one type of project, in particular, augmented reality or AR. AR seems to be an area of expertise for Cuseum as they have partnered with museums on several very successful endeavors not only bringing visibility to those institutions but also instigating a larger conversation about the relationship between art and technology. “Girl with a Pearl Earring” 1665, Johannes Vermeer. Image c/o 3D Bear. An emergent technology that has worked very well in museums thus far is Augmented Reality (AR). AR was popularized by the app Pokémon Go, but Cuseum sees potential beyond its entertainment value. Dan discussed the ways that AR allows visitors to examine granular details of museum objects, as well as experience collections as a whole in new ways. One criticism museums face is the disconnect visitors feel in regards to physical objects. Whether it be an artwork or artifact, visitors are encouraged to look from afar and therefore don’t have the opportunity to engage with the materials in other ways. Yet introducing AR to these spaces to touch, zoom in, listen, and watch said objects brings them to life. It is important to note that this digital experience is in addition to a physical encounter with the object itself. Dan was very clear that Cuseum’s projects are not intended to replace museum visits, but instead offer visitors a variety of ways to experience cultural institutions. In my opinion, this is especially pertinent in regards to making museum inclusive spaces for constituents of all demographics and education levels. Education is a primary goal is a part of most museums’ mission statements. The way museums go about implementing their educational agendas vary, but one very common (an arguably unsuccessful) method of information dissemination is wall text. Reading ten point font dry transfer wall labels next to a painting is not the greatest way to tell the story behind an art object. The small font makes it difficult for several people to read at the same time, and only so much can be said in a short paragraph. As museums try to be more inclusive and more open about their provenance and acquisition history, AR apps can serve as a platform to disseminate important information in an innovative and practical manner. Cuseum’s project with the Pérez Art Museum (PAAM) in Miami is a great example of going a step beyond wall labels and re-thinking the idea of an exhibition using AR as a vital component of the show itself. Felice Grodin: Invasive Space, on view in 2017, was a “virtually interactive, digital exhibition of commissioned works that employs the technology of augmented reality (AR), and is accessible to visitors using iOS devices in PAMM’s outdoor areas and in the Padma and Raj Vattikuti Learning Theatre on the museum’s first floor” (PAAM 2017). PAAM’s exhibition was incredibly successful, receiving both national and international acclaim for its use of technology and art. Dan drew our attention to the exhibition’s coverage by the publication Wired Magazine in their article “Augmented Reality is Transforming Museums”. Dan brought up a good point, suggesting that Wired coverage of the show is symbolic of the deconstruction of boundaries or silos between disciplines particularly art and science two fields that have traditionally been considered the opposite of one another. Visitor using the AR app in the gallery for the Art Gallery of Ontario, Toronto’s ReBlink Show. Image c/o The Sartler. Visitors were prompted to download an app on their device, which one could argue provides a sense of independence and autonomy in a museum visit. Artist Alex Mayhew was intentional in encouraging visitors to use their own devices as he understands they are something that we typically always have with us and use constantly. Mayhew initially recognized how distracting this technology can be, so he turned our draw to our phones and tablets on its head by delivering exhibition content where visitors already are. AGO’s work with Mayhew was so successful they would like to integrate more digital projects into their strategic plan. I argue that a large part of this success was working with an outside party who has the experience and expertise to make the project a success. While AR has been an incredibly successful endeavor for many museums, it is not the end all be all in regards to making museums engaging and relevant space in a quickly changing world. For instance, as I write this article I am aware that the lure of AR is quickly fading being replaced by newer technologies like VR (Virtual Reality). Although the number of mobile applications being created and downloaded every year is increasing, the digital projects of the cultural heritage institution and art institution sector cannot keep up. 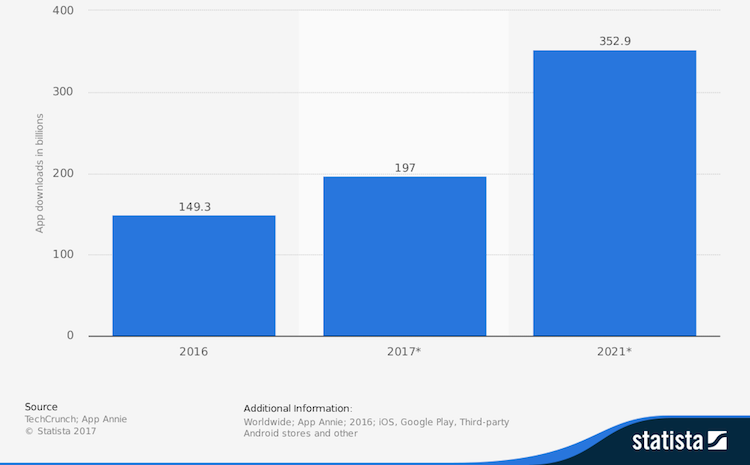 We see that the number of application downloads is predicted to increase to upwards of 350 billion by the year 2021. But upon closer inspection, we see that the apps being downloaded are an elite few. Bygone are the days of games like Angry Bird or other entertainment apps ruling the App Store charts. 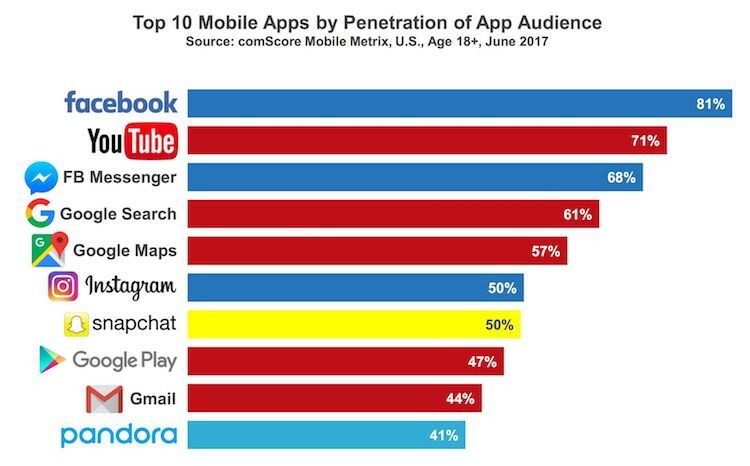 Now social media and consumer-oriented apps like Amazon and Instagram dominate the market. As we saw with artist Alex Mayhew’s exhibition ReBlink, he taps into the interest of the museums’ constituents. If organizations like Cuseum are able to create projects with this same idea in mind, especially in regards to social media, they too can take advantage of the obscene amount of time we spend on Instagram, Facebook, and Twitter incorporating these existing interest into the museums’ collection. Technology is here to stay, but iterations are fleeting. New digital projects are being developed every day. Even as I write this blog post on AR I am aware of its eventual decline as emerging technologies like Virtual Reality come onto the scene. Although at this current moment a VR headset is still much more expensive than an AR phone application, one day this may not be the case. In thinking about a museum’s digital strategy, goals should be revisited in order to reflect on the current technological environment. Take advantage of resources like Cuseum! If possible, museums and cultural institutions should try to work with outside companies when developing larger scale digital projects. When asked about digital literacy among museum information professionals, Dan noted that we should have an understanding of what’s out there. Attending conferences and being aware of trends. In my opinion, having an understanding of the digital landscape will put whoever is writing the digital strategy in an advantageous position because they will know what to ask for. At that stage, a company like Cuseum can work with the museum to see their goals to fruition. All in all digital technology is a future permeating every fiber of the human experience, even the seemingly analog world of museums. In addition to AR projects, Cuseum has worked with museums on projects like Digital Memberships and Digital Tours. As museum information professionals I suggest we think as Dan and Cuseum do, thinking radically and intuitively about how technologies can help museums better serve their communities. During his talk, Dan told us the following, “If Andreessen Horowitz says ‘Software is eating the world’ than culture is feeding the world”. An astute observation signifying museums force as a constant in a constantly changing world. Talking w. Dan in a truly technological fashion, viaGoogle Chat! Digital Partnerships: Reflections on a Conversation w. was originally published in Museums and Digital Culture – Pratt Institute on Medium, where people are continuing the conversation by highlighting and responding to this story.